Check out this construction company marketing case study & learn some of the strategies that DeWinter Marketing & PR deployed to help this company double its revenues in four years. Colorado-based Ash & White Construction was a successful, multi-million-dollar construction company. Although the company name reflected a partnership scenario, the company president had served as the sole owner for more than 10 years. The owner also was planning to construct a new headquarters building to coincide with the company’s 20-year anniversary and said he was ready to “take the company to a new level.” For him, that meant both developing a brand that reflected the company’s current ownership status, as well as increasing revenues. In addition, the old Ash & White company logo featured an unmemorable logo coupled with a dull gray and black color palette. Based on the goals of this company’s owner, DeWinter Marketing & PR Agency President Courtney DeWinter initiated a comprehensive re-branding program. She started with a fast-track, “guerilla” branding research process that included group interviews of the company staff; one-on-one customer interviews; and a fast-track analysis of competitors. 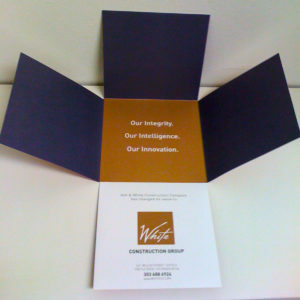 Based on the feedback, insights, and common denominators that came to light from this process, she recommended a new company name, a new logo and graphic identity, a new tagline, new market positioning, new messaging, an updated web presence, and updated sales collateral, as well as a formal launch of the newly branded company. 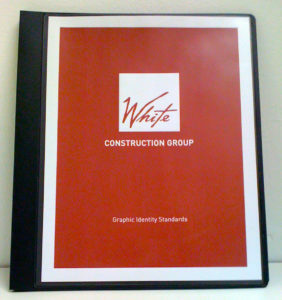 After exploring multiple options, the company was re-named: White Construction Group. What Hasn’t Changed: Our Integrity. Our Intelligence. Our Innovation. Inside the folded announcement was a placeholder for a new business card – and this piece was mailed and distributed by email, too. Upgrades to sales strategy and business pitches, and more. DeWinterComm deployed an integrated marketing and public relations program over the course of four years, along with training of White Construction Group staffers. After four years, DeWinter Marketing passed the baton to in-house staffers who took over marketing activities for the company. The new company name & branding reflected an up-to-date presence & accurately reflected the company ownership. Company revenues doubled in that four-year period. When pursuing a new corporate identity, branding research is one of the best investments a company can make if the goal is a truly strategic new brand and graphic identity.